Jerzy Stuhr, the director and star of the remarkably sweet Polish comedy The Big Animal, has a large, lumpy body and a massive face, yet he’s not the least bit threatening. His Zygmunt Sawicki, a bank clerk, is a gentle big guy, and when an abandoned camel from a visiting circus finds its way into his backyard one night, he takes it as a good sign. Elated with the new direction his life has taken, he walks the camel through the village and talks consolingly to it. Tethered outside Sawicki’s dining room window, this pet pokes his head inside during mealtimes, and when Sawicki plays his clarinet—he performs in a band—the animal responds with a wonderful humming sound. This scene might well be the oddest sing-along in movie history, but Stuhr, both as director and as actor, never makes fun of Sawicki—or the camel, for that matter. When the townspeople begin to complain about the beast for reasons that sound small-minded and spiteful, Sawicki defends his friend, and so does his wife, Marysia (Anna Dymna), who organizes the local kids for a camel-naming contest. None of the names, however, which include Hunchback and Fuzzy, is deemed dignified enough by the Sawickis. They have their pride. Stuhr appeared as an actor in numerous films directed by Krzysztof Kieslowski, who wrote the script for The Big Animal in the early seventies, when he was still making documentaries and long before his Decalogue and the Three Colors trilogy. The screenplay, subsequently set aside, was revived only after Kieslowski’s death in 1996 and produced in 2000. The vagaries of international film distribution impeded its U.S. release until now, but it’s worth seeking out. Shot in lustrous black-and-white by Pawel Edelman, who filmed The Pianist, it has some of the melancholy charm of a Czech New Wave movie like Ivan Passer’s Intimate Lighting—a sadness that at times is indistinguishable from joy. Life is a chore, says the movie, but you never know when a camel may wander in and change things for the better. What at first seems absurd becomes perfectly natural for the Sawickis, if not for their neighbors. They care for this animal as the dearest of guests. In the film’s comic high point, they decide he hails from Arabia, and go about the task of building him a mosque to bed down in. Naturally, the townspeople deride this venture as conspicuous consumption. Clearly, Stuhr and Kieslowski have worked up a political allegory—has there ever been a good (or bad) film from Eastern Europe that wasn’t one?—but it’s not of the hit-you-over-the-head variety. When an officious villager wonders why “normal” pets aren’t good enough for the Sawickis, we are cued to recognize, subtly, that bureaucrats invariably reject what they don’t understand. 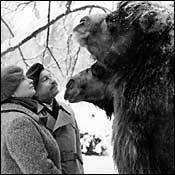 Audiences for this film should have no such qualms: When the camel lolls his jaws at dinnertime, or sways his Bactrian bulk, you may decide you’ve never seen anything quite so hilarious—or magnificent.